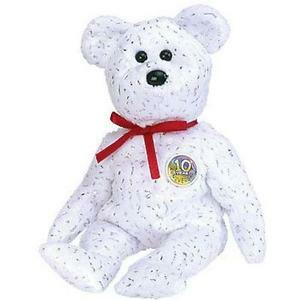 Decade is made from a white material covered in sparkly bits. He has black button eyes and a larger black button nose. He wears a red ribbon tied around his neck and a “10 Year Anniversary” button on his chest. Decade was released on 14th March 2003. His birthday is on 22nd January 2003. Decade retired on 1st October 2003.